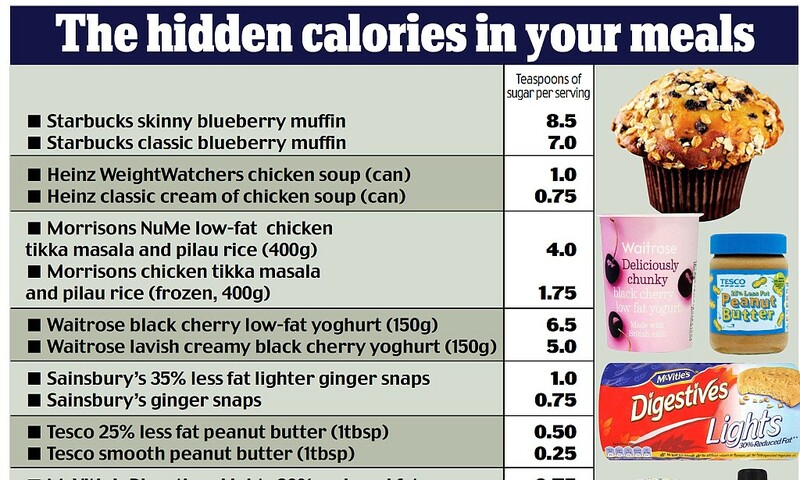 Low Carb Diet News - Tag Archive for "Hidden Sugar"
Low fat foods ‘contain 20% more sugar than full fat equivalents’Experts label some of sugar levels found in a probe as dangerous Eating ‘skinny’ version of certain products could lead to health risk Channel 4′s Dispatches tests some of UK’s best-known food brands By Sean Poulter Low fat food sold as good for you is often anything but because it contains more sugar, a study suggests. It found manufacturers are making their ‘healthy’ options more palatable by replacing fat with sugar. Graham MacGregor, professor of cardiovascular medicine at the Wolfson Institute, said people need to reduce their consumption of both. ‘The problem is, not only are we developing vascular disease but we’re getting obese and getting diabetes, and that’s due to too many calories,’ he added. Hidden levels of sugar in alcohol revealedShe also expressed concern about the wider effects of alcoholic drinks on health, partly because they tend to contain high calorie levels. “The average quantity of alcohol consumed per person in the UK remains far higher than 50 years ago,” her report stated. “Excess alcohol consumption is associated with cardiovascular disease, cancers of the digestive organs, breast cancer, and suicide.” An analysis of sugar levels in cider, sherry and spirits found that some drinks contained as many as five teaspoons of sugar in a single serving. By contrast wines and beer contained significantly smaller quantities. Campaigners and nutritionists said the study showed how alcohol contained “hidden” sugars which could contribute to a series of health problems. Aseem Malhotra, a cardiologist and science director of Action on Sugar, a campaign group, said: “The amount of sugar in some of these alcoholic drinks is really quite astonishing. …Since 1990 the World Health Organisation (WHO) has recommended that intake of “free sugars” should be less than 10 per cent of total energy (calorie) intake. Free sugars are sugars that are added to foods by the manufacturer, cook, or consumer; plus those naturally present in honey, syrups, fruit juices and fruit concentrates. Researchers recommend halving the threshold to less than 5 per cent of calories – around five teaspoons a day – would bring further benefits, minimising the risk of dental cavities throughout life. Paula Moynihan, Professor of Nutrition and Oral Health at Newcastle University said: “Part of the problem is that sugary foods and drinks are now staples in many people’s diet in industrialised countries, whereas once they were an occasional treat for a birthday or Christmas. We need to reverse this trend. The study was published in the Journal of Dental Research.